Leading off today: You would have had better odds picking Saturday's Powerball numbers than anticipating all the twists and turns in Glens Falls' wild, 75-74 victory over Lowville for the NYSPHSAA boys Class B basketball championship in Binghamton. For the record, the winning numbers in the lottery drawing were 30, 34, 39, 53 and 67. And the "power ball," which is the difference between winning $1 million or the whole $492.1 million jackpot? That would be 11, which just happens to be the number on the uniform of Joe Girard III. Girard and his Glens Falls teammates didn't walk away with big money on Saturday. Instead, they left Floyd L. Maines Veterans Memorial Arena with a memory that will last a lifetime. Girard's last-second lay-in in overtime salvaged a victory that seemed out of the question any number of times in the preceding minutes and added to the legend of the Syracuse-bound No. 1 scorer in New York high school basketball history. The winning bucket left him with an even 50 points on the stat sheet, literally making for an average night for JG3, who averaged 50 points a game last season and 49.7 thus far as a senior. What happened in the contest's final minutes was anything but average. Here's a look back at the sequence that set up the electrifying conclusion. Nip and tuck: Neither team had much breathing room or margin for error throughout the final 16 minutes of regulation. Lowville led by as many as 11 points in the second quarter and was still up three points at the half before JG3 scored the Indians' next 22 points, including all 18 in the third quarter to put Glens Falls ahead by six entering the fourth. The Red Raiders had no choice but to double-team JG3 with or without the ball the rest of the way, but the supporting cast stepped up, with Trent Girard finishing his night with 11 points and Brendan Quirk bagging 10. End of regulation: Lowville chipped away and was actually up by 63-60 after sophomore Aidan MacAuley made one of two free throws with :35 to go. JG3 and David Barclay misfired on the ensuing possession, but Connor Girard made a save to give the Indians the ball back under their basket. JG3 stepped back at the top of the key, three teammates forming a wall to fend off defenders. The 3-point attempt found the bucket to tie the game, and Glens Falls made a defensive stop to keep Lowville from shooting at the other, bringing about the overtime. Early advantage to Lowville: With teammates Connor Bach and Gavin MacAuley having fouled out, it was left to Aidan MacAuley to carry much of the load for Lowville -- and he delivered. MacCauley, who would finish with 30 points and four assists, scored seven points in overtime to help build a 74-70 lead. Glens Falls was now resorting to a fouling strategy, hoping to overcome free throws with field goals even though Lowville would be shooting the bonus the rest of the way. In doing so, however, the Indians needed to resort to situational substitutions to protect JG3, who was playing with four fouls. A rare JG3 mistake: Two JG3 free throws cut the deficit to 74-72, and Glens Falls fouled Hudson White, who missed both free throws. Lowville fouled JG3 on the ensuring possession, sending one of the most automatic free-throw shooters in recent memory to the line with a chance to tie with :05 showing on the clock. He calmly made the first free throw, but the second seemed disastrous at the time. Sensing that his free throw was off line, JG3 started chasing down the potential rebound. In doing so, however, he stepped over the line before the ball made contact with the rim and he was whistled for a lane violation. What made it doubly painful is that the ball actually did find its way through the hoop, first rolling on the rim and hanging there ever so briefly before grazing the net on the way down. The lane violation had taken the tying point off the board. A Glens Falls break, but ...: Lowville called a timeout to set up its inbounds play and Glens Falls coach Rob Girard again subbed out his star player, knowing that the Red Raiders' first preference might have been to inbound to whomever JG3 was guarding to take the star out of the equation if the game went to multiple OTs. Both coaches understood that making one or both free throws would put Lowville ahead, but JG3's 6-for-24 shooting on 3-pointers for the night meant nothing; he was the one guy on the court who would have been a danger to hit from long distance and win the final. Coming out of the timeout, Lowville was trying to inbound from beneath its defensive basket when the unthinkable happened. It was tough to tell how much was actual contact and how much was embellishment, but Glens Falls senior Kyle Vachon drew an offensive foul call on Lowville's Brett Tiffany inside the paint. remaining and had a full arsenal of options ... except JG3 was still on the sideline. Because he had been removed from the game during the timeout and technically no time had run off the clock on the illegal screen, JG3 could not yet return to the game. If Glens Falls was going to win, the Indians were going to have to resort to Plan B. But JG3 wasn't actually done: Being guarded on the baseline by Aidan MacAulay, Trent Girard was just to the right the lane as he tried inbounding the ball to Quirk. Tiffany got a hand on the ball but couldn't control it. The ball bounced out of bounds with :03 to play, thus allowing JG3 back into the game. 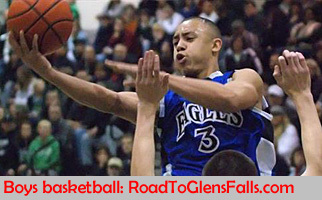 Glens Falls set up what looked to be the same play that freed JG3 up for the tying 3-pointer in regulation. Trent Girard would inbound, this time from left of the key, and JG3 and the other Indians players were lined up on the foul line parallel to the baseline. Lowville was having none of that however. The Red Raiders had learned their lesson. They left the ball unguarded, positioned four defenders in front of the Glens Falls fence alignment and one defender behind it. If JG3 was going to pull off a repeat of the step-back-and-shoot, he was going to have to do it over Aidan Zehr. Game, set, match: Trent Girard saw his cousin lines up second from the right and ever so slightly behind the three other Glens Falls players. Taking the ball from the referee, he waited for JG3 to roll off the back and around the fence. Zehr chased from the back and Aidan MacAulay converged from the front as JG3 swept around the right end. He had a step on both as Trent Girard hit him in stride eight feet off the baseline and slashing toward the hoop. A dip of the left shoulder and a dribble. MacAuley is closing hard on his left shoulder and Tiffany is converging from inside the paint. By the time he reaches the hoop, Girard is taking on a defender front and back, each with an arm raised. Behind the play, Trent Girard is racing off the baseline, excitedly jumping in anticipation. He knows what's coming. JG3 pushes off hard from the right leg, bringing himself back in from just behind the backboard. Up strong, both hands on the ball. The ball kisses glass and drops through as time expires.